Instead of a Big 12 championship, Texas soccer players Julia Grosso and Emma Regan will compete for an invitation to the World Cup this month. 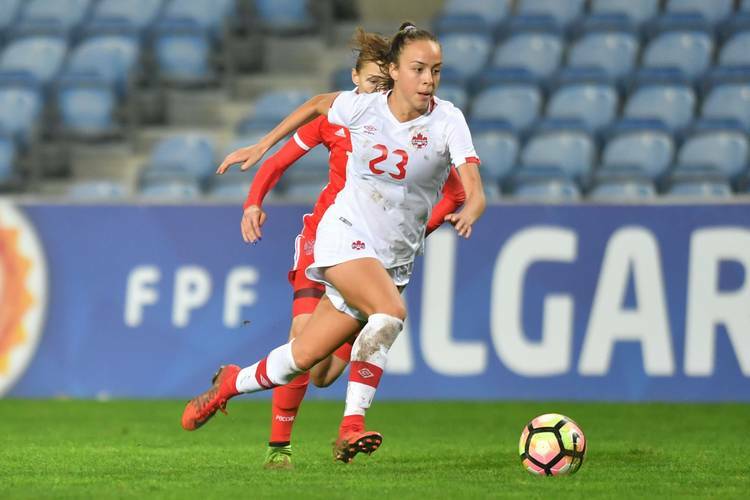 Grosso, a freshman midfielder from Vancouver, and Regan, a freshman defender from British Columbia, have made the Canadian Women’s Senior National Team’s 20-player roster for the CONCACAF Women’s Championship in Edinburg and Frisco and Cary, N.C. The tournament begins Thursday and runs through Oct. 17 and serves as a qualifier for the 2019 World Cup. Placing two Longhorns on Team Canada’s roster must be music to the ears of UT coach Angela Kelly, who started for Canada in the 1995 World Cup. But she insists she’d root for any country that has a Longhorn on the roster. Grosso and Regan’s participation in the CONCACAF event comes at a price to Texas, however. Starting with Friday’s match at Iowa State, Texas (9-1-2, 1-1-1 Big 12) has three conference games scheduled while its two Canadian freshmen could be gone. One of those will be Sunday at West Virginia, which is leading the conference with a 3-0 mark (7-2-3 overall). Grosso and Regan have both missed UT’s last three matches because of their responsibilities with the national team. Grosso also missed two non-conference matches earlier in the season because of a friendly match that Canada played with Brazil. According to UT, Texas is one of nine schools that will be represented in the CONCACAF Women’s Championship. Like Texas, UCLA and Florida State are down two players. Florida State, Texas and UCLA are ranked 10th, 13th and 15th in this week’s United Soccer Coaches poll. Said Florida State coach Mark Krikorian, who has temporarily lost defender Gabby Carle (Canada) and midfielder Gloriana Villalobos (Costa Rica): “To be honest with you, when you recruit players like that you know that opportunity for them is going to come.” Krikorian added that keeping the absent student-athletes up to speed in the classroom was an equal concern. Krikorian said he once lost a half-dozen players during a season to international competition. This is a first for Kelly, who took over at Texas in 2012 after a 12-year run at Tennessee. Texas recruited both Grosso and Regan knowing they had aspirations to play internationally. Kelly noted that both players arrived at Texas “on an accelerated path. To both their credit, they expedited that.” Grosso has appeared in seven games as a midfielder, and Texas allowed only four goals in the eight games that Regan, a defender, started. Texas is 1-1-1 without them. The Longhorns, Kelly said, will have to create a new identity without their Canadians and that will be a collective effort. UT does not name captains, but a player-voted leadership committee of Hintzen, Paige Hooper, Katie Glenn and Kayra Dollas does exist for guidance. Grosso and Regan’s absence has given Texas a chance to test the depth it boasted before the season. UT had only three seniors on last year’s roster. Senior Chelsea Surpris, who has started in Regan’s place the last three games, played in 2,004 of the 2,005 possible minutes of the 2017 season.